Welcome to the bingo offers and promotional page for Bingo Hearts. Here you will find details of promotions that we recommend including information on how to join this online bingo site as a new player. Alongside this, we may detail previous promotions if available, for you to see the type of offers that Bingo Hearts gives its players. Play at the online bingo website Bingo Hearts between Friday and Sunday and you will be able to take part in their Weekender Bingo Games providing you have met the minimum deposit requirement. These nine games take place every week and in total are worth £720 in real cash prizes with no wagering requirements. The games are only open to funded players and you must have made a single deposit into your account of £50 within the previous 6 days before the weekender games take place. You will then be eligible to take part and buy your tickets to these games during the pre-buy period. On a Friday, Saturday and Sunday the games are played at the same times and the total prize money and ticket costs are the same on each day. There is a game at 6pm with tickets costing 5p each and the full house prize money of £100. All players who were 1TG (one to go) will share £20. The next game is at 8pm with tickets costing 10p each. The prize, this time, is £50 for the full house and all 1TG players share £10. The final game in the evening is at 10pm and is the same as the 8pm game. These online bingo games are repeated over each of the three days. The maximum number of tickets you are permitted to buy for any of the games is 96. However, if you purchase the maxiumum you will be given a further 14 tickets for free. 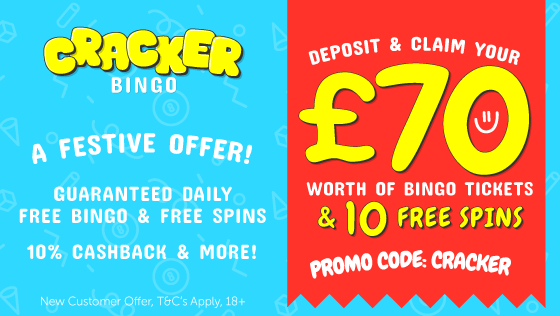 So if you are looking for some guaranteed prize money bingo games at the weekend, pop over to the Bingo Hearts Login and access your account and join in the weekender games! 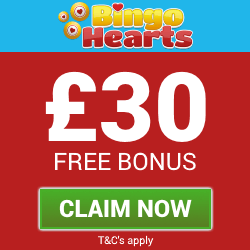 For full terms and conditions of this promotion, please visit the Bingo Hearts website. If you do not yet have an account with Bingo Hearts but would like to join in any of the promotions available on this page, then signing up with them as a new player is quick and easy. Just click the blue coloured button at the bottom of this page or any of the claim buttons within the promotional articles. Any of these actions will take you to the Bingo Hearts website. Once you are on their home page, just select the JOIN NOW button and this will open the online registration form. Complete this in full to open your account. Once your account is open, not only will you have a great online bingo experience at Bingo Hearts but as a new player, you will get a welcome bonus when making your first cash deposit. Fund your account with between £5 and £35 and you will get a 200% free bingo bonus and a 100% free slots bonus. This is worth as much as £105 in free bonus funds. So why not click the button below, go to the Bingo Hearts login and open an account today. You will get to enjoy these great bingo bonuses and also you can then join in the great regular and special one-off promotions available at Bingo Hearts.